Obsession is back with a vengeance! See these cool back packs? I want my boys to go back to school with them. Oh yeah! Nothing says "Gimme your lunch money", "I'm King of the Playground" badass but these angry babies. And they will look oh-so charming on my boys, I can tell. They're available at Clipper Novelty Store --that ever-reliable store where we bought the boys' Super Mario Brothers collection. But hell, these bags sell for an arm and a leg! Guess because they have the fangs for it. Haha, I made a funny! 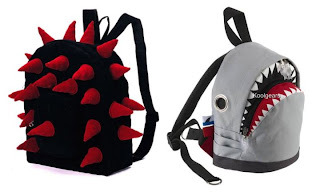 Aaaanyway, there's still a week before school starts so who knows --I might just win the lotto and score these badass bags for my badass boys before then. Fingers and fangs crossed. Hah! Another funny again! The joke's on you, Shrek! And That's How Toy Story 3 Rolled!